*(Due to audio trouble, I recorded the video and the sound was rubbish, the youtube channel is pushed back one week. Look out for the first installment next Friday the 13th. Auspicious start, I know.) In addition and to celebrate the release of Scarlet and the Queen of the New World, I'm starting a youtube channel to run biweekly in tandem with the blog. I'll read samples of the novels and some original work a bit too short for traditional publication. 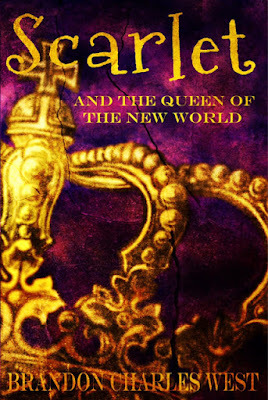 I haven't as yet named the channel, but the first episode will be uploaded this *Friday and I'll be reading the Preface from Scarlet and the Queen of the New World. Below is the write up for Scarlet and the Queen of the New Word. If you haven't joined Scarlet yet, you might not want to read further. Instead, Click Here and begin at the beginning, with Scarlet and the Keepers of Light. I look forward to your reviews and comments. And more than anything, I hope you enjoy book three! For two years Scarlet has been trapped in the world she once thought of as home, separated from her family and desperate to find a way back to the magical world of Satorium. With her nemesis getting stronger by the day and his threat over both worlds imminent, Scarlet would like nothing more than to concentrate on her magic, focus on getting back to Satorium, and maybe carve out a moment or two to herself. Unfortunately, everyone seems to have other plans. Meanwhile, as her mother and sister flee the destroyed Illuminora, her father and the dwarves of Jar-Alvis must raise an army strong enough to stand against the whole of Leona and the evil that threatens both worlds . . . unless war finds them first. Forced into the role of queen to the budding city of Washington’s Haven, Scarlet must face up to her responsibility as the savior of thousands, all while trying to navigate the complexities of being sixteen. But when a disturbing dream turns out to be a premonition, even her considerable power might not be enough to turn the tide . . . Thank you for volume 3-the journey continues to amaze! It is now halfway through 2018. I have just finished Scarlet and the Queen of the New World and already I feel bereft. When can we hope for the next instalment? I am starting the series all over again to fill in the gap, while waiting for the next book. I read these to my eldest granddaughter, but only after I have sneaked and read it first. It is a wonderful series and thank you for sharing your talent as a storyteller.